A little over a year ago, Alexandria restaurant owner Noe Landini, took a drive into Washington, D.C. with a friend, scouting possible restaurant locations. 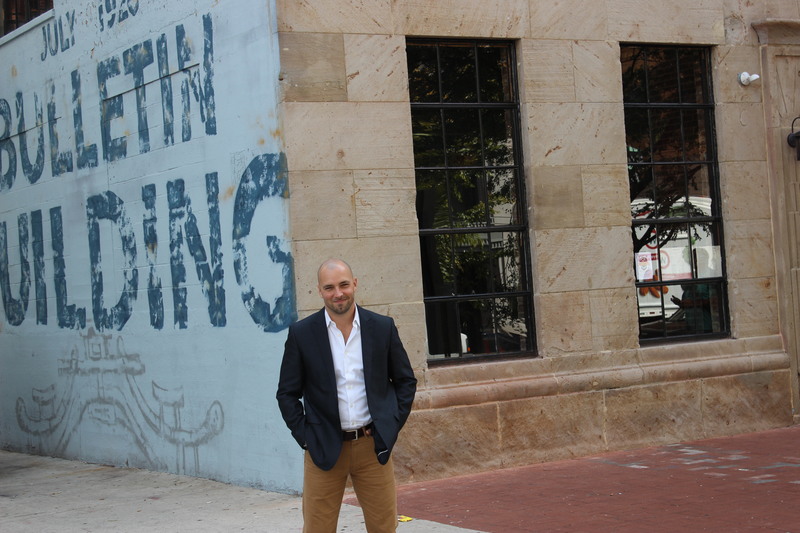 When they got to 717 6th St. NW and Landini saw the historic Bulletin Building, he was hooked. Here was a property that he could fashion into something spectacular. The charm of the building is its’ size. In a corridor of 13 story buildings, Bar Deco stands alone as an inviting place that is all restaurant. The industrial character of the structure has a certain charm in a canyon of concrete and glass. The Bulletin Building is a four-story limestone structure in the hip Penn Quarter and is across the street from the Verizon Center. The building was built in 1928 for the United Publishing Company. The main façade of the building is constructed in limestone, and features four art deco relief panels that portray the printing trade and ties the building to the trade that it housed for 60 years. The building was listed on the National Register of Historic Places in 2008. 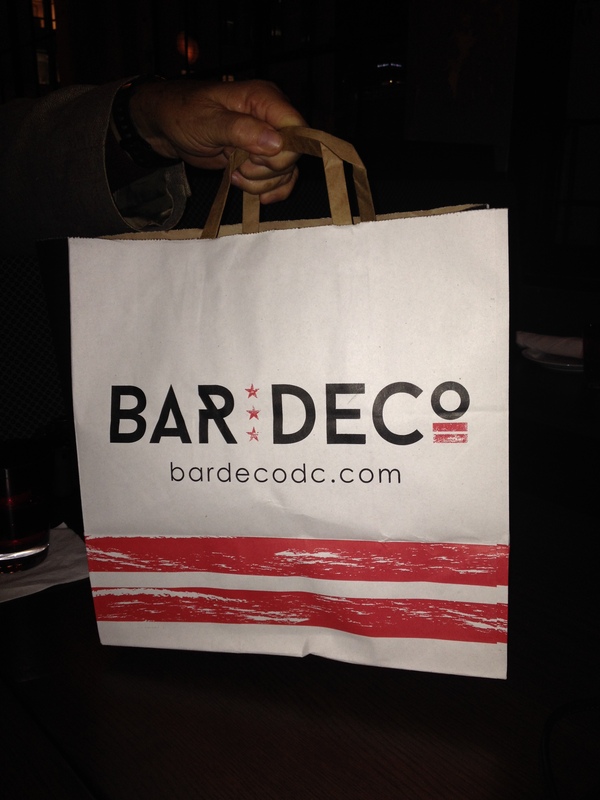 In a stressed painting application Landini added the words Bar Deco. 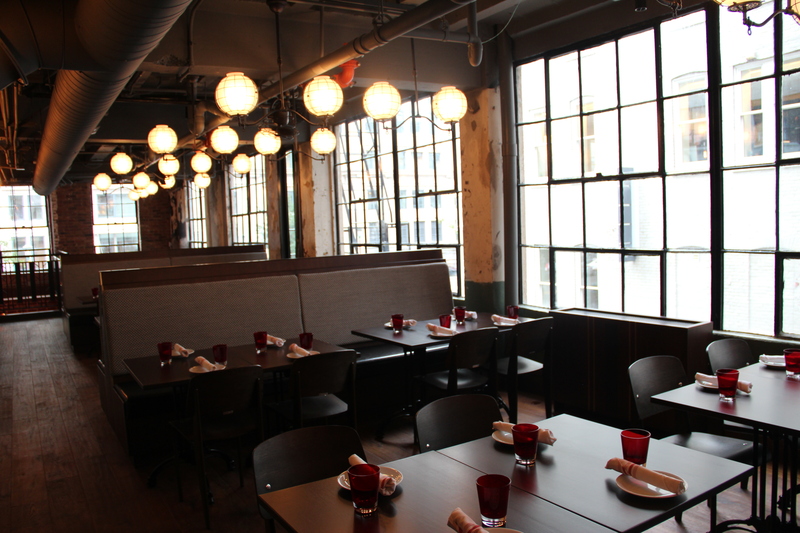 The four-story, 8,000 square-foot restaurant seats 331 guests. The first floor is for the hostess stand and show cases the two huge smokers and wood-burning fire located behind a glass enclosure. The aromas coming from the smoking meats are sure to whet your appetite. The kitchen occupies the rest of the floor. You can take the stairs or the newly installed elevator to the main dining room on the second floor. The room is true to its’ storied past with industrial style windows and the faux crumbling walls which enhance the art deco appeal. 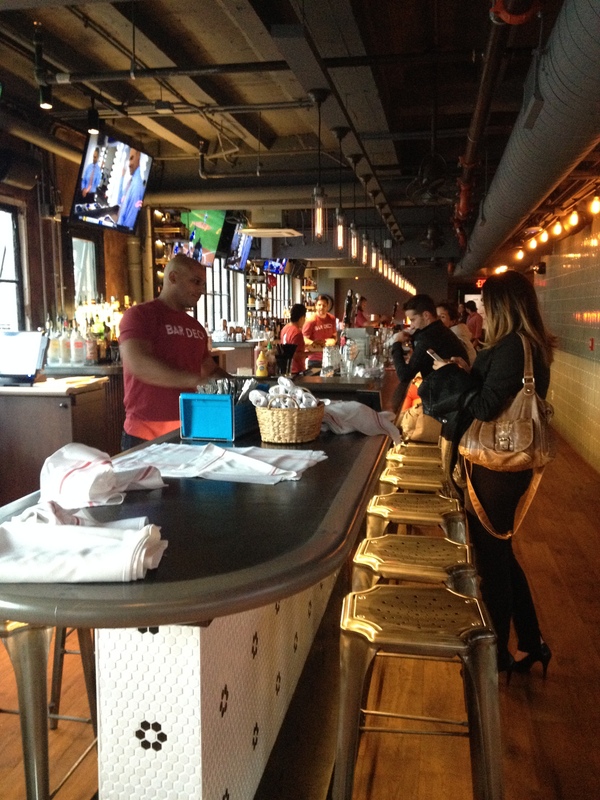 On the third floor you will find a 50- foot bar and numerous high tops and booths to accommodate the happy hour crowd. This is definitely a high-energy bar with hip music and TV’s that line the wall behind the bar. This is a great place to watch sports as well! For a more laid back experience there is the roof-top patio bar. In addition to the bar are two and four person high tops that also accommodate folks for drinks or dinner. Even though the nights are cool, overhead heaters keep the patio at a comfortable temperature. This is a great place to kick back and enjoy a starry night. On our visit there we started with Happy Hour at the bar on the third floor and ended with a tour of the roof top patio. 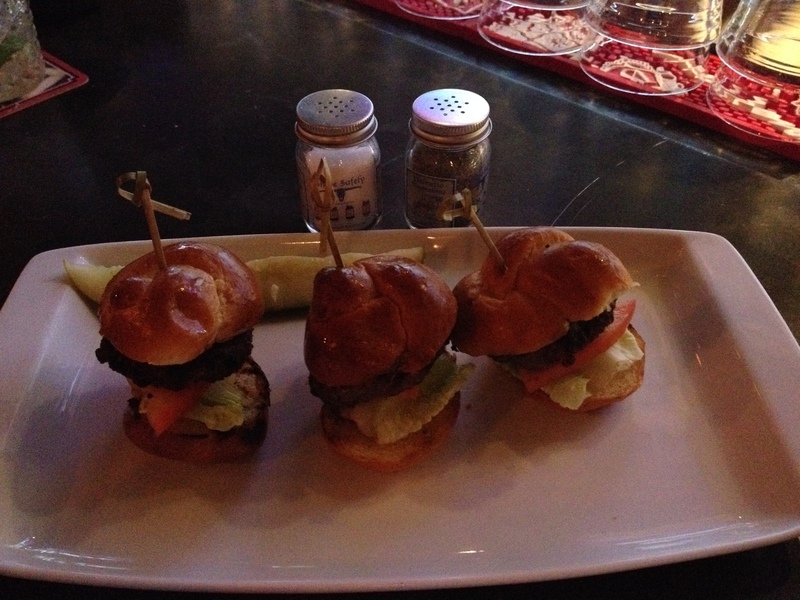 Along with our custom made margarita and good old vodka and soda, we enjoyed one of the specials on the bar menu – the trio of bacon sliders. It seems redundant to go through a lot of explanation about the food since we were told that the menu changes as the seasons do, but you can’t go wrong with these sliders! Maybe they will become a staple among the appetizers. We then moved to the second floor dining room for dinner. I ordered the Shrimp & Grits. I love my grits and these were the “Real McCoy”. Nice and smooth with just the right amount of seasoning. I am not a big fan of head-on shrimp but these were done perfectly and they were very large. My dining companion steered toward the healthy side of the dining aisle and ordered the 6th Street Salad. This is a house specialty and a health nuts dream meal – baby kale, roasted beets, avocado, wood grilled cauliflower, spiced sunflower seeds, sharp white cheddar, red quinoa and your choice of house made lemon vinaigrette or greed goddess dressing. We ran out of room for dessert but were assured that they won’t disappoint either. Everything on the menu is locally sourced flavorful food made from scratch. The menu isn’t overwhelming and has enough diversity to satisfy any palate. The portions are large (you will be taking home left overs, I can guarantee) and the price points on both the cocktails and food is very reasonable considering the location of Bar Deco. Compared to the price point at the neighboring Clyde’s, this place is a great deal. Like most new eateries opening these days, Bar Deco features craft cocktails, local craft beers and a fairly extensive wine by the glass selection. The wine pours are hefty and the cocktails are quite healthy. It is hard to find a good mixed drink in the DC area for under $10. Bar Deco had only been open a little over a month when we were there so they are still working out some kinks – waiting for artwork, touch up on the build out, etc. – but they hit the ground running. They are open for lunch and dinner seven days a week and brunch on Saturdays and Sundays. Make it a point to check them out the next time you head into the *District. *Parking is available at Gallery Place and on the street but carries a hefty price tag. I recommend that you take the metro yellow line to Gallery Place and walk the short block to the restaurant.